'The amount of foil needed to wrap five breakfast sandwiches': a new metric for genomics? Back in 1990, sequencing 1 million nucleotides cost the equivalent of 15 tons of gold (adjusted to 1990 price). At that time, this amount of material was equivalent to the output of all United States gold mines combined over two weeks. Fast-forwarding to the present, sequencing 1 million nucleotides is equivalent to the value of ∼30 g of aluminum. This is approximately the amount of material needed to wrap five breakfast sandwiches at a New York City food cart. Most people will understand the point that is being made here. Sequencing used to be really expensive whereas now it is very cheap. But is there really a need to explain what 30 grams of aluminum foil amounts to in a more, human-friendly, unit? And even if such a comparison is deemed necessary, is the use of 'breakfast sandwiches' from New York City food carts the most suitable choice? Altmetric is a service that tracks the popularity of published research articles via the impact that those articles make on social media sites. Put simply, the more an article is tweeted and blogged about, the higher its Altmetric score will be. The scoring system is fairly complex as it also tracks who is reading your article on sites such as Mendeley. I was pleased to see that the recent Assemblathon 2 paper — on which I am the lead author — gained a lot of mentions on twitter. Curious, I looked up its Altmetric score and was surprised to see that it was 61. This puts it in in the 99th percentile of all articles tracked by Altmetric (almost 1.4 million articles). I imagine that the score will possibly rise a little more in the coming weeks (at the time of writing the paper is only four days old). I was then curious as to how well the Assemblathon 1 paper fared. Published in September, 2011, it has an Altmetric score of 71. This made me curious as to where both papers ranked in the entire list of 1,384,477 articles tracked by this service. So I quickly joined the free trial of Altmetric (they have a few paid services) and was able to download details of the top 25,000 articles. This revealed that the two Assemblathon papers came in at a not-too-shabby 5,616th and 10,250th place overall. If you're interested, this paper — with an off-the-charts Altmetric score of 11,152 — takes the top spot. 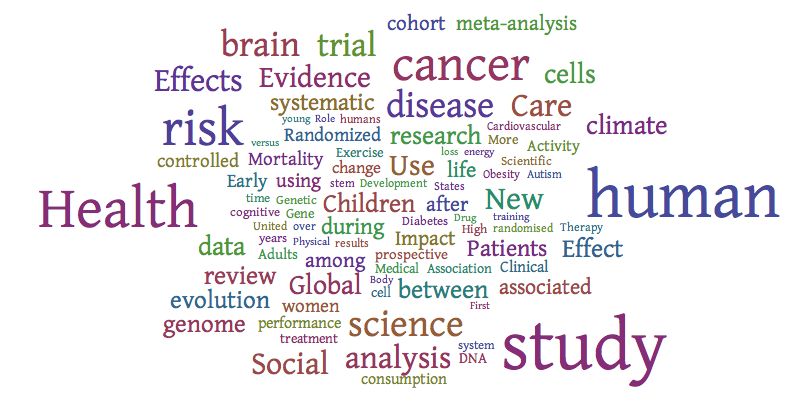 Just to satisfy my curiosity, I made a word cloud based on the titles of the research papers that appear in the top 10,000 Altmetric articles. Perhaps unsurprisingly, this reveals that analyses (and meta-analyses) of data relating to human health prompt a lot of engagement via social media. Okay, time to go and write my next paper 'A Global Study of Human Health Risks'.